WOW 😯 what a storm we just had. I cannot tell how many inches in total but I do know we cleaned off decks about 4 times and Steve plowed our driveway 3 times. My estimate is about 2 feet though. It was still snowing last night when I went to bed so I am not sure if the groomers all went out last night or will be out today. No word from the club as of yet but we will update you on trail conditions soon. There are ice shacks on Big Wood but we have not heard how safe the west end is near the club house so please use extreme caution. 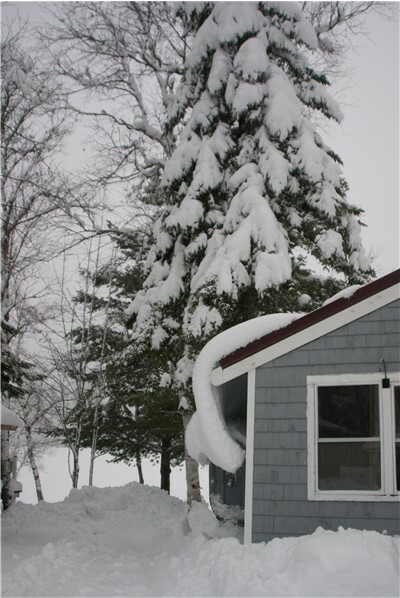 Yes this post is titled “Trail Report” but the way the snow is curling off the cabin roof is just cool. As of today, you can get to south to Parlin and East to the Birches. We have panned toward Pittston Farm and they are getting their end done today. 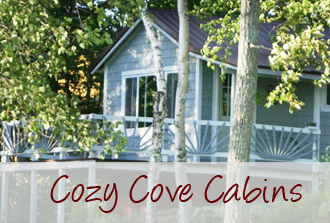 So if you have not made your reservation yet, plan a great 3 day weekend for New Years ❗ Give us a call. 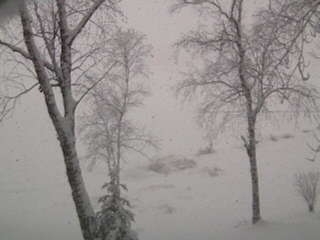 As you can see from this webcam shot, everything is white and it is snowing pretty hard. It looks like in town right now, we have about 6-8 inches and more North, it looks like 8-10 or more. The forecast is for another 12 inches by morning. Obviously, the trails are not open yet but if this keeps up, they should begin grooming soon. We will keep you posted. Big Wood was frozen on the eastern shore and on Sunday past, the west side looked like it froze but with all of this snow on top, we do not know how thick it is yet. 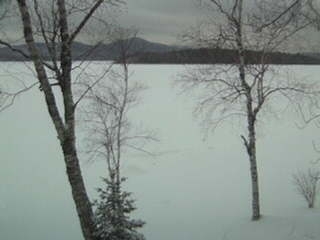 It will sure be ready for Ice fishing on January 1st. Get the sleds and gear ready. It is going to be a fantastic season!